Following on from the recent post on buying tips for metal lunch boxes, I thought it would be helpful to discuss a few resources that provide some guidance on valuations. In other words price guides! Now in its 17th edition this best selling guide provides guide prices and extensive descriptions for over 32,000 toys. New editor Justin Moen has also included a special 16-page report on toys from the 1980s. For us lunchbox enthusiasts there are many of the post-Second World War classic boxes listed. 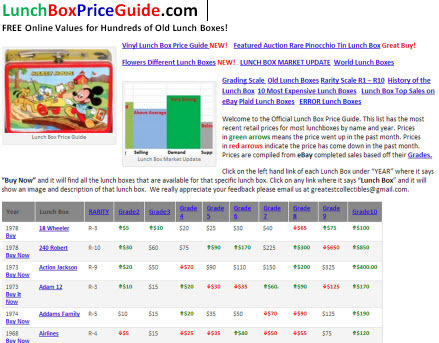 If you have a strict budget then this report from the LunchBoxCollector.com might be a good option. At just $3 you don’t even have to wait for postal delivery as it is a downloadable document that is delivered by email. It provides estimated valuations of metal lunch boxes from the 1950s to the 1980s and includes many full color lunchbox photos. The website also offers a couple of other eBooks including the 2011 Original Lunchbox Art Photos & Price Guide and the 2011 Lunchbox Collecting Information Guide. Slightly more expensive at $89, this guide looks nothing less than amazing! Whilst collecting usually focuses on items from the US, the interesting thing about this book is that it covers pieces from no less than 9 different countries. This looks like great stuff (albeit pretty expensive). However, just one word of caution: If you are considering this then please take a look at some of the reviews on the link I just provided. It looks like there is some poor feedback on delivery times. There are other price guides that I’ve found but I thought I’d keep this post short and stick with just these 3 as they seemed the most appealing to me. I have just ordered the 2011 E-Guide myself so stay tuned and I’ll let you know my opinion on it in a future post. Meanwhile, I’d love to hear from you if you own any of these products before. Please do leave your comments below!